I thoroughly enjoyed this book! 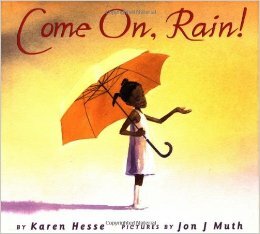 I admired how the author, Karen Hesse, explored drought through the well expressed senses of a young girl and her surrounding community. This book, which, by the way, is one of the few picture books with a female of color as the main character, does a tremendous job of highlighting a science-based topic, while highlighting and honoring the connecting people and relationships. As mentioned above, this book is one of the few fictional picture books, with a science theme, that has a female of color as the main character. The story not only portrays the main character as a keen observer and science knowledge producer, but also highlights her connection to her mother, to her friends and her role as leader and community connector.